What if Megatron was a first-person shooter and Devolver Digital slipped him way more drugs than he could handle? What kind of power-up do you get from wearing high heels? Do you really need more ammo than what a single revolver can hold? Heavy Bullets, out now on Steam Early Access, aims to answer these important questions. 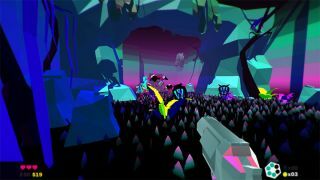 Heavy Bullets is Brazilian developer Terri Vellimann's debut game. It arms you with a revolver, “six devastatingly plump” bullets, and asks that you use them carefully to reach a security mainframe. Levels are procedurally generated, and a variety of power-up like coin magnets and high heels should make every attempt feel different. It's what you might call a first-person shooter roguelike, or a roguelike-like, or whatever the kids are calling it these days. Vellmann started working on it in September 2013, and has been updating it steadily according to feedback from members of the TIGSource forums. Out now on Steam Early Access , Vellmann will keep adjusting the game according to feedback until its planned July 2014 launch. The main takeaway here is that it looks trippy and cool, and sounds good too thanks to Doseone, who also made the music for Samurai Gunn.